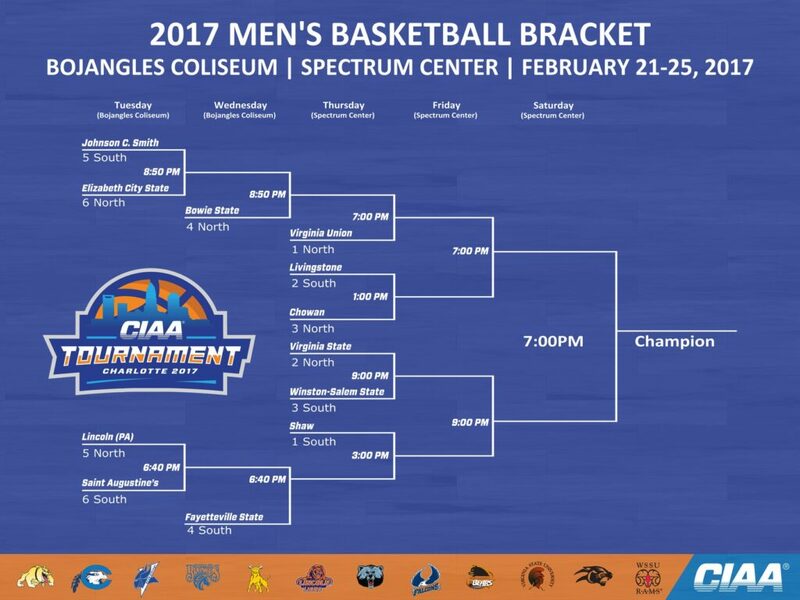 Charlotte, NC – The Central Intercollegiate Athletic Association (CIAA) releases its 2017 Women’s and Men’s Championship Brackets. The single-elimination tournament will be held in two venues this year: Bojangles’ Coliseum February 21-22 and Spectrum Center February 23-25. The final championship contests will tipoff at 4:00 p.m. for the women with the men to follow at 7:00 p.m. on Saturday, February 25. The Northern Division of the women’s side concluded the regular season with a three-way tie for the Division Title. Chowan University, Virginia State University, and Virginia Union University all finished the season with a 7-3 division record. While the teams will be awarded Co-Northern Division Champions, the conference utilizes the following tiebreaker protocol to determine tournament bracket seeds: head-to-head competition, point differential, and conference record. While Hawks split victories with the Trojans, Virginia State was downed twice by the Lady Panthers of Virginia Union. However, Chowan defeated Virginia Union in both meetings this season. Therefore, Chowan is awarded the No. 1 seed with No. 2 Virginia Union and No. 3 Virginia State to follow. Bowie State University won their final regular season game for a 6-4 division record and No. 4 rank going in to the tournament. Lincoln (PA) University and Elizabeth City State University round out the North at No. 5 and 6, respectively. In the women’s Southern Division, Johnson C. Smith University clinched the title despite today’s loss versus Shaw University. The No. 2 ranking fell to a three-way tie with Livingstone College, Winston-Salem State University, and Shaw University holding a 6-4 division record. After the tiebreaker protocol is applied, Livingstone takes the No. 2 with Winston-Salem State and Shaw to follow. The Blue Bears defeated the Rams in both regular season matchups and tops Shaw due to point differential. Livingstone won 88-73 (+15) while Shaw won 63-60 (+3). Winston-Salem State and Shaw also split victories in the regular season and tied in point differential. Winston-Salem State won 65-59 (+6) and Shaw won 66-60 (+6). When conference records are taken in to account, the Rams (9-7) sit atop of the Lady Bears (8-8). The remainder of the Southern Division is held by No. 5 Fayetteville State University and No. 6 Saint Augustine’s University. Tuesday’s Women’s Tournament contests are as follows: 10:00 a.m. Bowie State vs. Fayetteville State, 12:10 p.m. Virginia State vs. Saint Augustine’s, 2:20 p.m. Shaw vs. Lincoln (PA), and 4:30 p.m. Wisnton-Salem State vs. Elizabeth City State. In the quarterfinals, Livingstone will await the winner of Virginia State & Saint Augustine’s for a 10:00 a.m. tipoff on Wednesday while Chowan will await their opponent between Shaw & Lincoln (PA) for their 12:10 p.m. contest. The winner between Winston-Salem State & Elizabeth City State will advance to face Virginia Union at 2:20 p.m. and Johnson C. Smith will play the winner between Bowie State & Fayetteville State at 4:30 p.m. The men’s Northern Division came down to the wire, but was clinched by Virginia Union. The Panthers ended the regular season with an 8-2 record, a tie with Virginia State. In head-to-head competition, both teams won one game each. Virginia Union won 90-71 (+19) while Virginia State won 74-59 (+15). Number 3 was secured by Chowan after today’s overtime victory over VUU. Bowie State, Lincoln (PA), and Elizabeth City State round out the bottom three spots. The Shaw Bears sit atop of the South as the Division Champion with an 8-2 record in division contests. Livingstone and Winston-Salem State faced-off today for the No. 2 seed. WSSU took the victory to tie LC at 6-4 and make a split mark in head-to-head contests. However, Livingstone holds on to No. 2 due to point differential. The Blue Bears won 101-96 (+5) while the Rams won 78-74 (+4). The Broncos of Fayetteville State earned No. 4 atop the tied Johnson C. Smith and Saint Augustine’s teams. JCSU defeated SAU twice for the advantage. Tuesday’s Men’s Tournament contests are as follows: 6:40 p.m. Lincoln (PA) vs. Saint Augustine’s and 8:50 p.m. Johnson C. Smith versus Elizabeth City State. Games will continue on Wednesday evening with Fayetteville State versus the winner of Lincoln (PA) & Saint Augustine’s at 6:40 p.m. and Bowie State versus the winner of Johnson C. Smith and Elizabeth City State at 8:50 p.m. Thursday, February 23 encompasses a full slate of men’s games starting at 1:00 p.m. with Livingstone and Chowan. 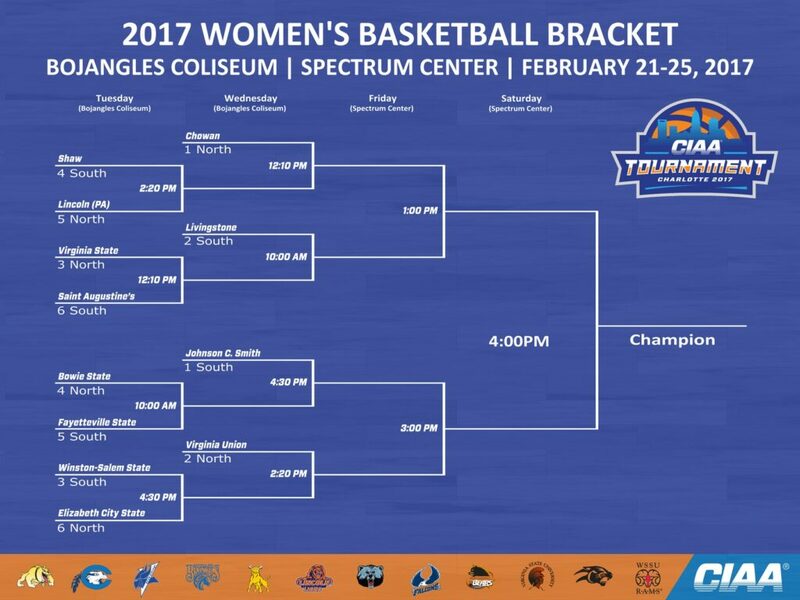 The Shaw Bears will play at 3:00 p.m., Virginia Union at 7:00 p.m., and Virginia State versus Winston-Salem State at 9:00 p.m.